The majority of us take our brain, and its capability, for granted. As we move through life we remain unaware of the internal processing that takes place just to allow us to remain conscious and are blissfully unaware of the decisions our brain makes for us as we breeze through life. Despite the awe-inspiring capability of our brain, as the human environment continues to rapidly change, the capability of our brain to adapt and remain efficient comes into question. This time, the perceived threat is the “horror” that is Artificial Intelligence (AI). Self-learning machines that think far quicker and smarter than us. The irony is that our learning-hungry brain that allows us to make these incredible leaps in technology, has now created something that has the potential, in some people’s opinion, to make our brains obsolete, especially when it comes to decision-making. The ability of our brain to interpret large amounts of new data along with previous knowledge to make effective decisions has been at the heart of our evolution. In the business world, our brain has created hierarchies based on experience and expertise – with the ability to make insightful decisions often being the underpinning key to power. Will humans lose the ability to make complex decisions? As the article by Merje Shaw describes, there are many examples in the modern workplace where machines are able to make complex decisions on our behalf. Such examples seem to be diminishing the decision-making tasks that would allow a natural hierarchy and development opportunities to be created in an organisation. These progressions beg the question: what will be the impact on our future capability to make complex decisions and should we worry about this? From a neurobiological perspective, we know that the more we do something, the better we get at it. Each activity we repeat strengthens the connections in the associated areas of the brain that enables the particular activity. This goes as far as to create physical differences in our brains. The classic example being that of London Black Cab drivers who typically have an enlarged posterior hippocampus (associated with memory, particularly special memory) that enables navigation (1). The same can be found in musicians, whose brain regions are enlarged in areas associated with their dominant hands (2). A similar negative effect can be seen when we no longer utilise areas of our brain – essentially ‘if we don’t use it, we lose it’. A study at The University of Central London (UCL) in 2016/2017 highlighted the impact of Satellite Navigation on brain function (3). The research concluded that we lose the activation of our hippocampus and prefrontal cortex (the area of the brain associated with decision-making) when using satellite navigation, versus attempting to direct ourselves autonomously. The fear is that if we continue to allow AI to make our decisions for us, will those areas of our brain associated with complex decision-making fail to strengthen and grow our capability? In addition, the decisions that AI makes are algorithms designed to be failure proof (as one would expect). But as we know, humans learn through failure. Many well-known successful leaders are quoted as attributing their success to many prior failures and we continuously encourage our employees to celebrate failure as a learning experience, building our success in the future. The technology that enables AI was ultimately developed by learning from failure and creating improvements. Without these failures, how will we learn and develop further? And it’s not just AI that may be limiting the opportunity for us to strengthen our brains. James Williams of the Oxford Institute talks about the ‘attention economy’ that social media is taking us towards (4). Our lives are now dominated by others all fighting to get our attention so that we react – and react instantly. This is what Kahneman calls ‘thinking fast’ (5). Great for revealing our instincts and the heuristics that we all develop about how the world works, but really poor for ‘thinking slow’ which requires cool, considered evidence, time to weigh up the pros and cons and thoughtful problem-solving. If we’re not careful we become overwhelmed by reacting to those who want to get your instant attention and loose our ability to think slow. As technological advance and changes in our working environment reduce the natural development of decision-making capability, it falls to leaders to design purposeful developmental practices to ensure that effective decision-making capability is maintained in the key roles of any business. 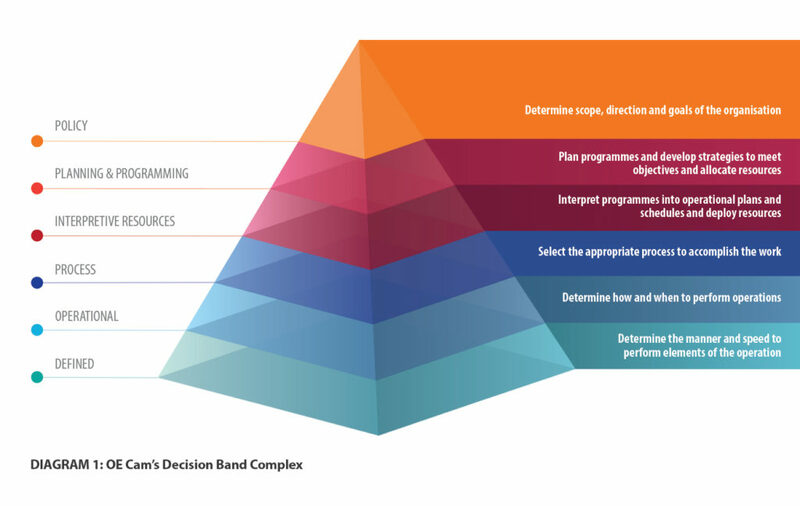 At OE Cam we work with the ‘Decision Band Complex’. (see diagram1). This helps us frame and describe jobs, remuneration and development pathways. It also helps us think about the impact of AI. Artificial Intelligence erodes human work from the bottom of the hierarchy. Tasks that require lower levels of decision making go first. Higher up the hierarchy the complexity mushrooms and more ‘slow thinking’ is required, trade offs and judgements need to be made. The more we become players in this attention economy the less able we are to think slow. The lower levels of decisions will increasingly be taken over by AI but the higher-level ones will remain. Views differ about whether they will all ultimately be taken over by AI: we think not. Professional firms are having to wrestle with the fact that much of the tedious work of auditing, searching for legal precedent and doing market research will increasingly be taken over by AI. So how will we train the professionals, develop their judgement and ultimately their professional wisdom if we’re no longer able to learn the job from the bottom-up? What decision-making skills do we need to maintain? Against all these pressures we need to help and develop managers to think slow, to think beyond reacting to all those that demand your attention. Problem-solving and decision-making skills are at the heart of ‘thinking slow’, being proactive (rather than reactive) and anticipating their environment effectively. In addition, we need to better understand our cognitive biases, the way in which our brains assess risk and what is now dubbed ‘behavioural economics’ (of which some say Kahneman is the Father). For example, OE Cam delivers workshops on building awareness of implicit bias to help individuals understand the psychological forces behind their decision-making. To learn more about how OE Cam can help improve decision-making, please see the box-out below. OE Cam use context relevant simulation exercises to build critical evaluation skills, alternatives and options to enhance breadth of thinking in leadership and other critical roles. Giving those involved the opportunity to fail in a safe and developmental focused environment, scope out options and practice flexible scenario planning. Using the OE Cam diversity framework, which focuses on effective organisational culture and collaborative techniques, we work with organisations to ensure diversity in the workplace. This ensures that learning from colleagues continues and that thinking is challenged, expanded and given depth via multiple differing perspectives. Using executive coaching, OE Cam works with leaders to change mind-sets and attitudes to ensure appropriate openness to failure and risk tolerance. Therefore learning through experience is continued, ensuring that failure is seen as an important aspect of development, via growth mind-sets and innovative aspirations.